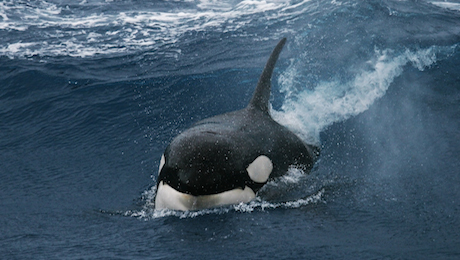 Biologists and computer linguists team up for the first time to decode the language of orcas and launch a scientific expedition into the mesmerizing inlets of Northern Canada and Norway. Tales and legends exist in many cultures of people blessed with a gift that allows them to communicate with animals. Understanding the language of animals is an ancient dream of mankind. Behavioural scientists like Konrad Lorenz, Jane Goodall or Dian Fossey are icons in this field, even if some of their methods are now considered somewhat outdated. A new kind of technology is currently being adapted to analyse the complex language of whales. This software promises to detect not only the smallest acoustic patterns, but even their underlying meaning and syntax. 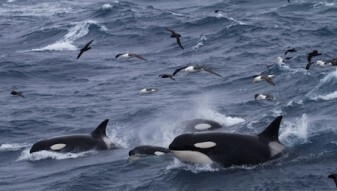 Many recordings have been made of killer whales exchanging calls during their strategically planned hunts, or when they are socialising or travelling. Due to technical limitations, however, it has not been possible to decipher these calls until now. Thanks to the ingenuous idea of young marine biologist Rey Sonmez, who teamed up with leading computer scientists, the patterns hidden within these vocalisations are now becoming decodable. „Whale Talk“ follows this scientific expedition into the long hidden domains of the orca whales of Northern Canada and Norway, and also offers us new insights into the threats the mammals now face.